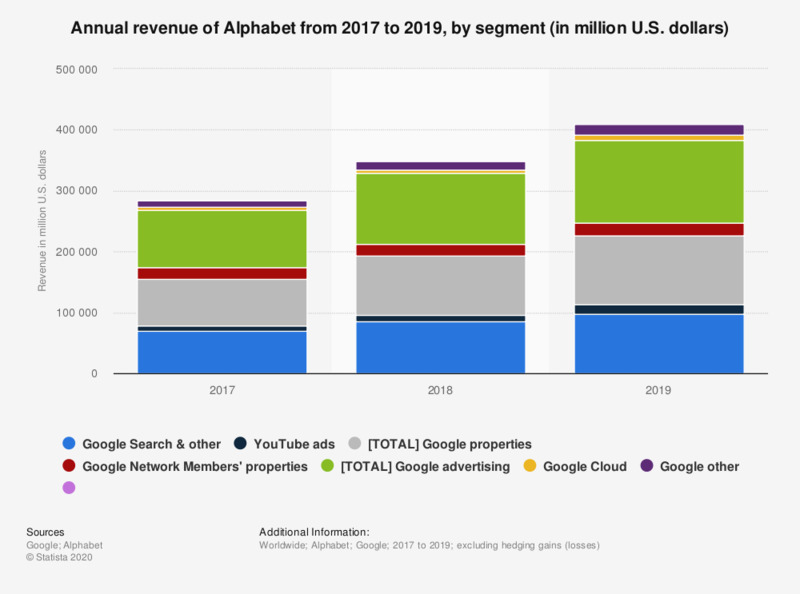 This statistic displays Alphabet's annual revenue, by segment, from 2013 to 2018. In the most recently reported fiscal year, Alphabet's revenue from Google websites amounted to 96.3 billion U.S. dollars, up from 77.8 billion U.S. dollars in the previous year. Alphabet Inc. is an American multinational conglomerate created in 2015 as the parent company of Google and several other companies previously owned by or tied to Google. Other Bets – Other Bets – Other Bets is a combination of multiple operating segments that are not individually material. Other Bets includes businesses such as Access, Calico, CapitalG, GV, Verily, Waymo, and X. Revenues from the Other Bets are derived primarily through the sales of internet and TV services through Access as well as licensing and R&D services through Verily. • Licensing-related revenue. • In Q1 2018, Nest joined Google’s hardware team. Consequently, the financial results of Nest are reported in the Google segment, with Nest revenues reflected in Google other revenues.